Mornington Peninsula Brewery has decided to have a bit of fun with its canning line. To date, its Pale and IPA have been the two beers to get the treatment but, now that they're old hands with the gear, they've decided to launch a series of small batch releases too. They're going under the #tinnage moniker and will be released in 300 case, never to be repeated batches, each featuring quirky artwork. 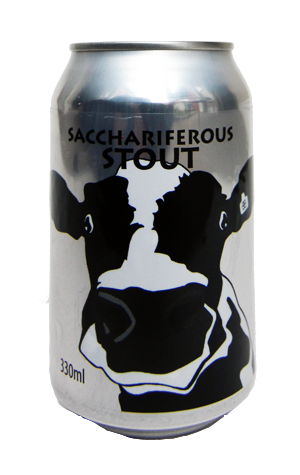 First up for the #tinnage treatment is a beer that first appeared in keg earlier this winter: the Sacchariferous Stout. It's a milk stout – in other words, one that features a portion of lactose (milk sugar). This adds a touch of sweetness and a creaminess to the body. But if that brings to mind something thick and dessert like, in this case it shouldn't. The beer is a mere 4.1 percent ABV so the lactose has the effect of gently rounding out the body of what could otherwise be a very light-on-the-palate beer. There are soft roast and cola aromas, a touch of liquorice to taste, and a roasty, bitter finish.